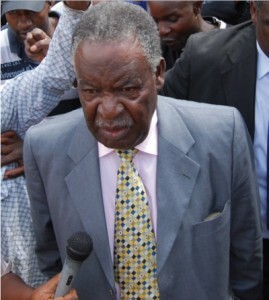 President Michael Sata late Monday evening of 12 August 2013 collapsed at State House a development that led to soldiers surrounding State House and the Zambia National Broadcasting Corporation premises, the Zambian Watchdog has been told. According to senior intelligence officers President Sata fainted for about 45 minutes at his official residence the Nkwazi House. His wife Christine Kaseba who is a medical doctor resuscitated the President. The source said immediately after he collapsed, Defense Minister Geoffrey Mwamba and Finance Minister Alexandra Chikwanda, Army Commander Paul Mihova and the Director General of Intelligence rushed to State House and quickly ordered the army to surround State House. One source said President Sata may within the coming few days fly out of the country for medical attention. “A lot of people have been asking why on Monday evening State House was surrounded by soldiers, I would like to tell the nation through our beloved Zambian Watchdog that the President collapsed. He was almost dying had the First Lady not intervened” the source said. The source said Sata was supposed to be at a London Hospital for three weeks but he could not because he did not want people to know that he was sick. ” Initially when you reported that the President had sneaked out he went to Hospital, he was supposed to be there for three weeks but he said let me go back and come again otherwise people will know, he may be going back very soon” the source said. After this incidence at State House, the following day there was need to show that Sata is ‘fine’. A statement firing Foreign Affairs minister Effron Lungu was issued by Sata’s spokesperson George Chellar. Sata was later shown on TV swearing in Bernard Chiwala. But it was announced that he would not travel to Malawi for a southern Africa Development Community (SADC) meeting for presidents which will take place in two days time. Chellah also announced that Sata would not be able to launch a roads rehabilitation project called Lusaka 400. This is actually the same project the MMD left in place but just renamed. Mr. Sata has a heart condition and prostate cancer that saw him being evacuated to South Africa by late president Levy Mwanawasa in 2008. So far Mr. Sata will miss the important SADC Heads of States summit that commences tomorrow in Malawi. Recemtly Defence Minister Geoffrey Bwalya Mwamba told the nation that Mr. Sata would start provincial tours to explain the PF government policy. It is not clear when he will start the tours for now.